Gold Wedding Band, Layered 22k Solid Gold Wedding Ring, Unisex Ring, Fine Jewelry, Chunky Gold Ring, Gift For Her, Wide Gold Band,Resizable. Announcement Welcome to my shop! Free shipping on all items to all destinations, Exclusive Hand Crafted Gold, Diamonds and Gems Jewelry, Bridal unique Jewelry, Wedding Rings, Engagement Rings, Antique Style Jewelry, Rough Gold Unique Rings. 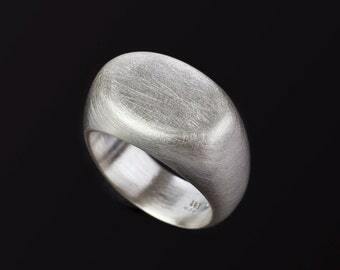 My name is iris harpaz and I'm a goldsmith and a jewelry designer since 1997. I believe that a piece of jewelry should be minimalistic but with a strong presence, fine and comfortable to wear. As every piece ordered from my collection is custom made for you, please allow up to 2-10 working days for items to be ready for shipping. PLEASE REVIEW MY SHOP POLICIES BEFORE MAKING A PURCHASE, AS IN PURCHASING AN ITEM FROM MY STORE YOU HAVE AGREED TO THESE TERMS. If you've got any further questions, please feel free to contact me, Iris. Welcome to my shop! 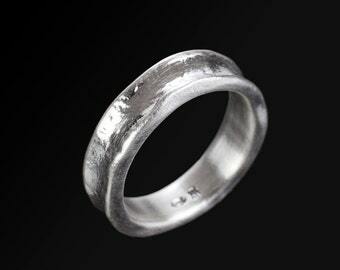 Free shipping on all items to all destinations, Exclusive Hand Crafted Gold, Diamonds and Gems Jewelry, Bridal unique Jewelry, Wedding Rings, Engagement Rings, Antique Style Jewelry, Rough Gold Unique Rings. 22k Gold Vintage Style Earrings, Beautiful 22k Solid Gold Stud Earrings with mobile 22k Gold Drops,Exclusive Design, Fine Jewelry,Handmade. 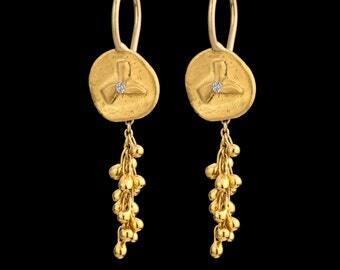 18k Gold Stud Earrings,18k Gold Seeds Hanging From 18k Gold Top,Fine Jewelry,Natural Design in Gold,Handmade,Exclusive Design. 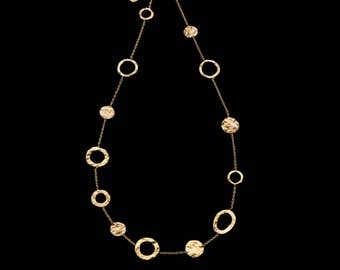 Dancing 22k Solid Gold Drops On 18k Chain Necklace, Delicate & Uniqe, Exclusive Design, Fine Jewelry, Handmade, Bridel Jewelry. 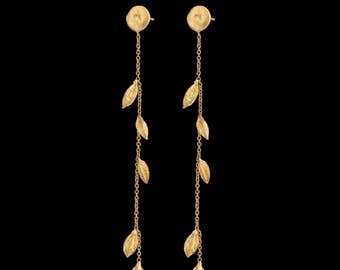 Delicate Cluster of 22k Gold drops Hanging from 22k Solid Gold Top with Diamond Earrings,April Birthstone earrings, Chandelier Earrings. 18k Gold Pinky Ring,Sunny Star Statement Ring,18k Signet Ring, Fine Jewelry, Chunky Gold Ring,Resizable, Gift For Her, Handmade. 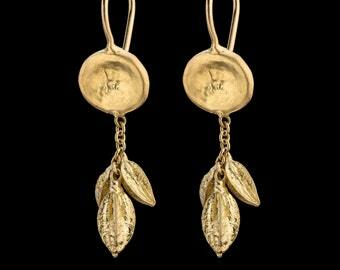 18k Gold Earrings,Cluster Of 18k Gold Seeds Hanging From 18k Gold Top,Fine Jewelry,Natural Design in Gold,Handmade. Hammered Coin & Hoops Necklace, 18k Solid Gold Necklace, Delicate Fine Jewelry,Exclusive Design,Handmade,Bridal Jewelry,18k Jewelry. 22k Gold Vintage Style Earrings, Beautiful 22k Solid Gold Mobile Earrings, Exclusive Design, Antique Style Jewelry, Fine Jewelry,Handmade. Hammered Coin Necklace, 18k Solid Gold Necklace, Delicate Fine Jewelry,Exclusive Design, Gift For Her,Handmade.Bridal Jewelry,18k Jewelry. 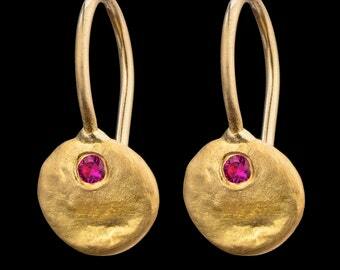 Ruby Gold Earrings,July Birthstone Earrings,Natural & Classic 22k Solid Gold Earrings with Ruby, Gift For Her, Fine Jewelry. Sterling Silver Signet Ring, Oval Statement Ring, Handmade, Fine Jewelry, Chunky Silver Ring, Silver Unisex Jewelry, Resizable. 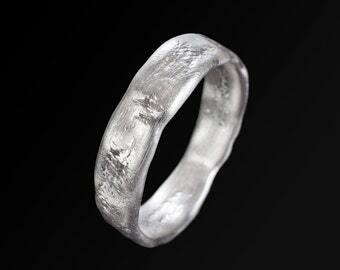 R-36-S.
Sterling Silver Wedding Band, Natural Rough Looking Fusing Silver Men's ring, Wedding Ring, Unisex Silver Jewelry,Handmade,Resizable. Love the rings, so delicate and beautiful. Thank you so much Iris! Reserved For Alina,Wedding ring,Delicate Gold Wedding Band, Natural Looking Thin 22k Solid Gold Fusing Ring, Unisex Jewelry, Handmade. I ordered this bracelet as Mother's Day gift for myself. :) I love it ... it's well made and the quality of the workmanship is exceptional! Great email communication with Iris and she shipped promptly to the US. Thank you, Iris! Reserved For Karen Rich Elegant 1 Row Bracelet made of 18k Solid Gold Handmade Beads, Fine Jewelry. My jewelry is specially designed and handmade by me down to the very last detail. I get my inspiration from nature, ancient and modern art, ethnic motives and life itself. The jewellry I make is delicate combining clean cut lines with natural flowing movement. I love working with high karat gold which enables me to use ethnic and ancient techniques. Making jewelry is my passion. I hope it shows. It is very important for me that you are happy with your jewelry. I accept returns and exchanges within the first 15 days of receipt. The item must be returned in perfect and unused condition in it's original packaging, by registered mail Please contact me to request a refund. Exchanges and Refunds will be issued minus shipping charges, fees, handling fees and customs, after I received the jewelry back in perfect condition. If you have an item you bought in my shop that needs repair you can mail (registered mail) the item to me for a free repair minus shipping charges . I will mail the item back to you at no charge. Just message me first. 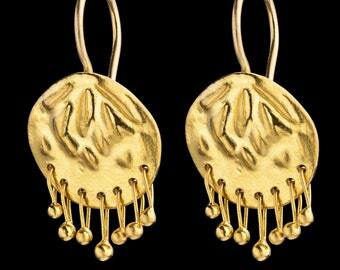 Returns or exchanges are not possible for earrings (for hygienic reasons), or custom made orders. Payment can be made through Paypal, a secure online payment system which is very easy to use. You may already have an account. If not, you don't need to sign up to use this service, and can pay directly through the site by credit card. Payment is expected immediately upon checkout. EMS Expedited airmail - 3-6 business days. Delivery times are estimated, I am not responsible for postal customs or holiday delays.